In 2017, the US Topo map production system was redesigned and modernized to provide a system that facilitates long term goals for more efficient production and continued product improvements. The new system produces maps in a format that uses a different georeferencing mechanism compliant with ISO 32000. The new products can continue to be viewed and printed with Adobe Reader or any comparable PDF viewing software. 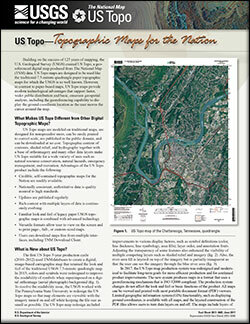 US Topo refers specifically to USGS topographic maps published as digital documents in 2009 and later. 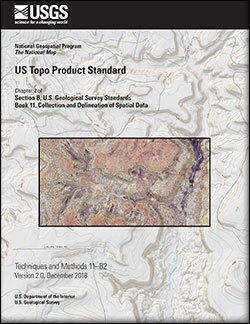 USGS topographic maps originally published as paper documents in the period 1884-2006 have been scanned and can also be downloaded free of charge through the same interfaces. These maps are now called the Historical Topographic Map Collection. The US Topo project repackages data from national GIS databases as traditional maps, primarily for the benefit of non-GIS users. Unlike traditional topographic maps, US Topo maps are mass-produced from secondary sources, on a rapid refresh cycle, using the best available data at the time of production. Our challenge will be to balance the needs of these communities, continue to improve quality and accessibility, and do it all with the available project resources.